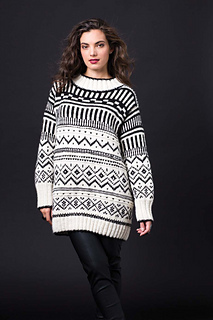 This hybrid Fair Isle pullover showcases myriad graphic patterns and textural ridges to great visual effect. 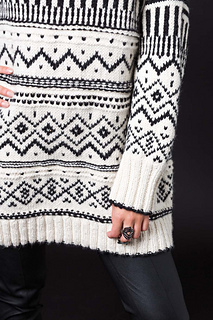 Zigzag bands in the lower body contrast well with the blockier patterns at the yoke. The unusual approach to construction involves working the body in the round inside out (or with WS facing) predominantly in purl stitches so floats won’t pucker the fabric or affect the gauge. Knit it in alpaca/merino Extra from Blue Sky Fibers.